Over the past year, student teams from across the Americas – including Mexico, Canada, Guatemala and Brazil – have been hard at work designing, building and testing their most ultra-energy efficient cars, capable of achieving hundreds, even thousands of miles per gallon. In fact, some teams have achieved over 3,000 miles per gallon! 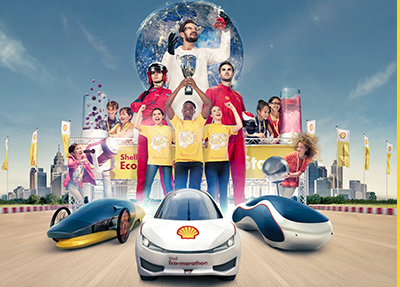 On April 10 -12, 2015, student teams from across the Americas will compete in the 9th annual Shell Eco-marathon Americas. Now, the global series that has challenged future engineers and scientists to go ever farther on less energy is moving to the epicenter of the North American automotive manufacturing industry – Detroit! 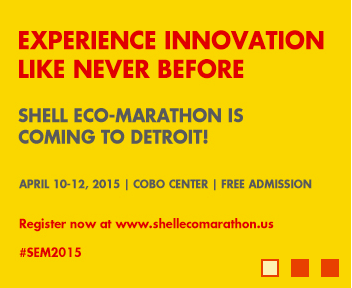 Shell Eco-marathon Americas 2015 takes place in Detroit, Michigan, from April 9-12, 2015 at Cobo Hall in Downtown Detroit. Student teams will bring their ultra-energy-efficient vehicles to compete on the streets, global thought leaders will address energy challenges of the future, and visitors of all ages will enjoy a FREE look into the future of energy, technology, and mobility. You’re invited to join in and take a look at the nuts and bolts of how these students design and build their vehicles. Admission is FREE and open to the public.